An individual has been going around posing as Andrew Vachss. He has victimized several unsuspecting women and men in a variety of ways. He claims to "be on the run from pedophiles," thus "explaining" the "plastic surgery" which has altered his appearance. His last known whereabouts were in Alaska. He especially favors self-help groups to make his "contacts." Rest assured, Mr. Vachss is not "on the run from pedophiles," and his appearance is as shown on the dust jackets of his books, in newspapers and magazines, and on television. Mr. Vachss still lives and works on both coasts, and in Chicago. If you have any questions or suspicions about anyone claiming to be Andrew Vachss, please contact us. Cyber-impostors are far more common. Please do not be taken in by anyone claiming to be Andrew Vachss via email or online chats. We have four official Facebook pages: Andrew Vachss, Pansy, Cross & Crew, and The Zero. As of September 2011, there have been many individuals (always without photos) listed on Facebook as "Andrew Vachss" and "Andy Vachss." These imposters are removed as they appear, but the process is a lengthy—and ongoing—one. The only twitter account with which we are associated is this one. If you have any doubts, please contact us. In the past, someone posing as "Vachss" with an email address of "vachssvox@yahoo.com" was trying to arrange private chats with unsuspecting individuals. That human is no more Andrew Vachss than any of the many others using "Vachss" as part of their screen name, email address or online "profile." Mr. Vachss does not have email nor does he hang out in chat rooms. The only way to contact Mr. Vachss via email is to send it directly to The Zero. Incoming email by Volunteers, and the messages which require Mr. Vachss' attention are relayed to him. Volunteers pass along Mr. Vachss' response, if any, from their individual email addresses. Mr. Vachss only answers email through official Zero volunteers. He is not online, not chatting (unless it is a bookstore chat or special event, which will be noted on this site). Bottom line: Check out exactly who you are communicating with before you do anything you might regret. Mr. Vachss' work, especially his non-fiction articles, is often plagiarized on the Net. We are not speaking of some academic "failure to attribute the source" conduct, which is easily corrected via notification. No, we are speaking of those who attempt to disguise their theft by giving the impression that they actually wrote the material. They usually do this by changing the "Introduction," making small alterations within the body of the text, or "vacuuming" portions of Mr. Vachss' work into their own. This is especially pernicious, because, in stealing the work of Mr. Vachss, they also attempt to assume his credentials and expertise, thus putting them in a position to "advise" and/or exploit innocent persons. And, because Netizens invariably copy and pass along articles they find of value to themselves, "Internet truth" is created, and the thief's "work" is widely distributed. Thanks to the alertness of the Zero community, many such offenders have been identified and dealt with. If you run across plagiarism of Andrew Vachss' works, please contact us to report the violation. I've seen the eyepatch on different sides of his face. And I read on newsgroups that Mr. Vachss wears the eyepatch on different eyes at different times. What is the truth? 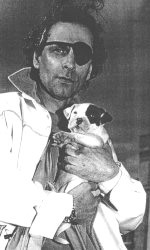 The eyepatch is, and has always been, worn over Mr. Vachss' right eye. It is worn for medical reasons. It is not a fashion statement. Several years ago, Mr. Vachss' publishers accidentally sent out some reversed photographs, meaning somebody in a darkroom made prints with the negative upside-down. As a result, some photos were published "showing" the eyepatch on the left side. Here is an example (from Elle magazine). Note the small heart-shaped tattoo between the ring and little fingers of his right hand. Note, further, that Jax, a pit bull pup (now fully grown), also has a "patch" on the same side of her face as Mr. Vachss. 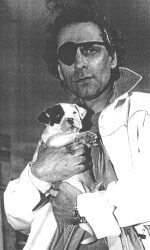 In the "reversed" photo, it's not just Mr. Vachss' eyepatch that has "shifted," it is also the tattoo on his hand. And the "patch" on Jax! as printed in Elle magazine. If I see the name "Vachss" in a website's URL, doesn't that mean it is owned by Andrew Vachss? No! It is easy enough to determine who actually owns any website. Just go to Network Solutions and look up the actual owner here. For example, until recently, neither www.vachss.org or www.vachss.net was owned by Andrew Vachss or connected to The Zero in any way. Be aware that "WHOIS" reflects whatever "information" the individual domain owners themselves submit. No attempt is made by the Internet registration service to verify such "information." Just remember: "I found it on the Internet" does not translate to "I found the truth." I read on the newsgroups that Mr. Vachss killed himself! You read it on the newsgroups? Don't be a chump—it's just another one of those planted-and-passed-along lies for which the Net is infamous. The Internet offers many things, but take-it-to-the-bank credibility isn't one of them. Andrew Vachss holds true journalism in high regard. But true journalists are getting harder and harder to find. He's written books about that (Two Trains Running), and short stories, as well (Underground). True journalists—like David Hechler, Nicholas Pileggi, and Jack Olsen—are the last line of protection for average citizens. There are major stories in the media when some purported journalists are fired for having fabricated stories; but there are others who do the same thing every day and don't even get reprimanded for it—because, like true journalists, true editors and true publishers are on the endangered species list, too. So be on the lookout, and don't be fooled: Just because it's in black-and-white doesn't make it true. The Web isn't the only place where lies get published.